Unity Adjustments have been assisting property owners for over 25 years. 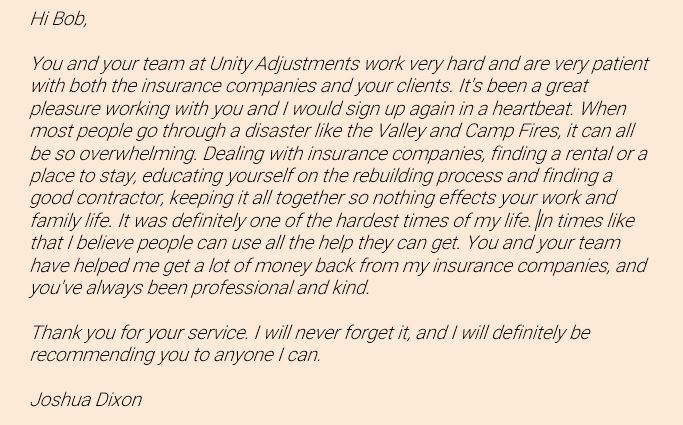 Unity Adjustments and their associated adjusters have been assisting property owners with catastrophe claims for over 25 years. Bob Ellenberg, manager of the Middletown, CA office has worked for both insurance companies and individuals helping property owners get full and fair settlement of their insurance claims. We do NOT have offices in big cities and show up after disasters for a short time. We have been in Lake County since the Valley Fire in September of 2015 and are still here serving clients. Our sole focus is disasters and we stay involved in communities as long as it takes. We will do the same for survivors of the Sonoma County fires of 2017 and the more recent Camp Fire.